A business model describes how a company does business and what its value proposition (benefits or offering to customer), value creation (resources, suppliers and other partners who help create value) and value capture mechanisms (cost structures and revenue streams) are. 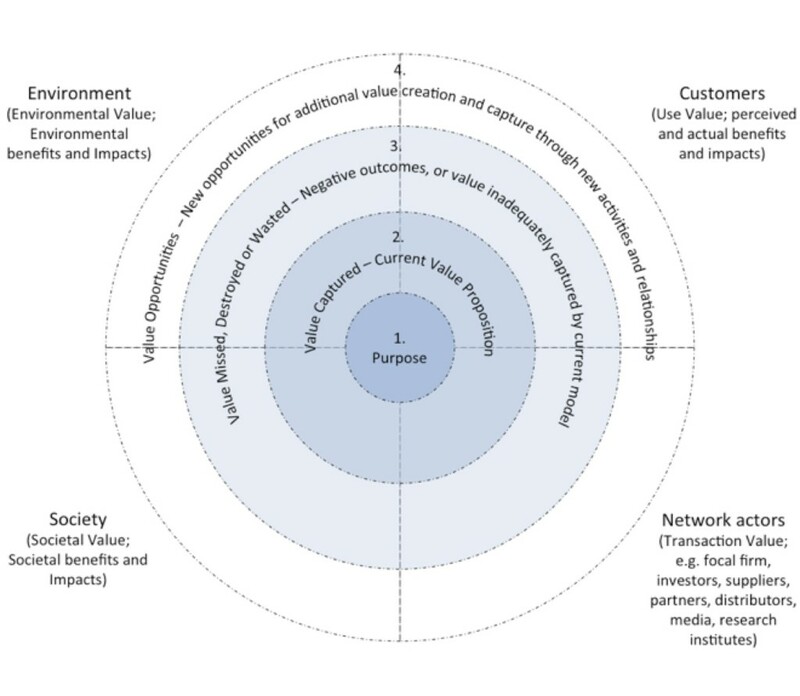 Sustainable business models consider a much wider group of stakeholders than just customers, and explicitly consider society and environment as stakeholders. They go beyond creating value for a customer and include concerns about the benefits and harms to society and the environment by the way business is done. This is a much more systemic view on doing business than making money by delivering benefits and value to customers. I am interested how current business models can become more sustainable and how start-ups can develop sustainable business models from the outset. Together with my colleagues Sam Short, Padmakshi Rana, and Steve Evans, I developed the Value Mapping Tool, to assist in ‘sustainable business modelling’ – the process of inventing new sustainable business model ideas. Customers – perceived and actual benefits and negative impacts. You may want to break this down into different customer segments. Network actors – in short, the firm and its supply chain responsible for creating value. This may be broken down into particular key suppliers or partners. Environment – benefits (afforestation) and negative impacts (e.g. emissions to air). Brainstorm 1: the purpose of the business is discussed. Why is the business here in the first place? What is the product or service offered by the company or business unit? What is the primary reason for the existence of the business (this should not be primarily financial)? Brainstorm 2: what value is created for the different types of stakeholders? What positive value is created and what negative value do all the stakeholders mitigate? Brainstorm 3: what is the value destroyed or missed or negative outcomes for any of the stakeholders? Consider for example, waste to landfill or loss of local employment caused by offshoring. Are there contradicting impacts at a global and local level? Is the business missing an opportunity to capture value, or squandering value in its existing operations? For example, are assets, capacity and capabilities under-utilised? Are potentially useful materials going to landfill? Brainstorm 4: This brainstorm is intentionally put at the end and is about blue-sky thinking. The focus is on turning the negatives into positives. What new positive value might the network create for its stakeholders through introduction of activities and collaborations? What can you learn from competitors, suppliers, customers or even other industries? Regarding your paper “A value mapping tool for sustainable business modelling” (2013), I am looking for a guide for facilitators with example questions as it is mentioned in the section 5.2.1 (Pre-workshop preparation) of the paper. It would be grateful if you please help me on this matter.